We've all seen fantasy versions of medieval swords and other weapons from video games, role playing games, movies, and the like. But what about weapons from the Middle Ages, whether antique weapons or illustrated in manuscripts, that are fantastic looking? In some cases, fantasy medieval weapons appear to be equally unusual and strange as modern fantasy creations. This thread is a chance to showcase some of these more unusual medieval creations. 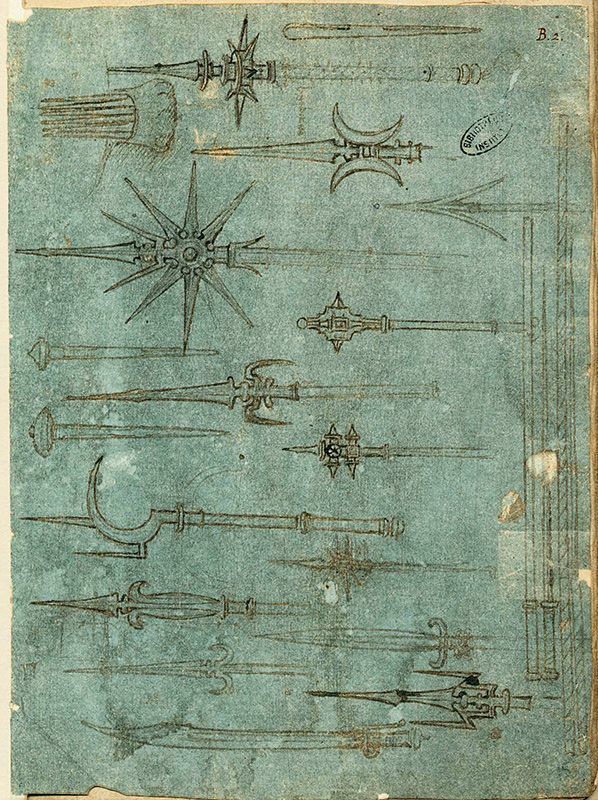 I want to emphasize again- the purpose of this thread is not to display modern fantasy weapons or illustrations, but rather "fantasy"-type weapons that were either created in the Middle Ages, or envisioned during the Middle Ages. Those backspikes you pointed out look like what an artist would draw onto that glaive if he never saw the weapon but had it described in quite a lot of detail. Would the famous Maciejowski-chopper fit the bill for this one? Sure, I think it's sufficiently unusual to make the list. Same with things like Leonardo da Vinci's polearm studies, or some of the exotic dueling weapons found in Talhoffer or other fencing manuals. NYPL MA 104 Bible History, from 1445. 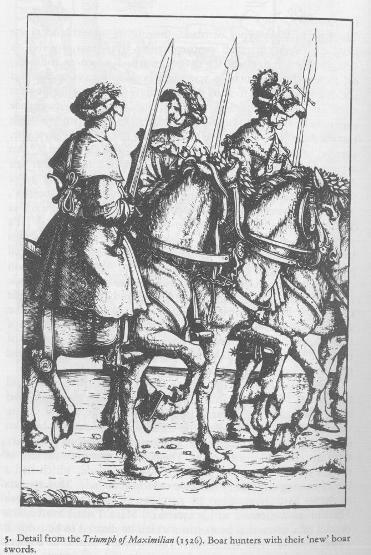 Have a look at the third polearm from the left. 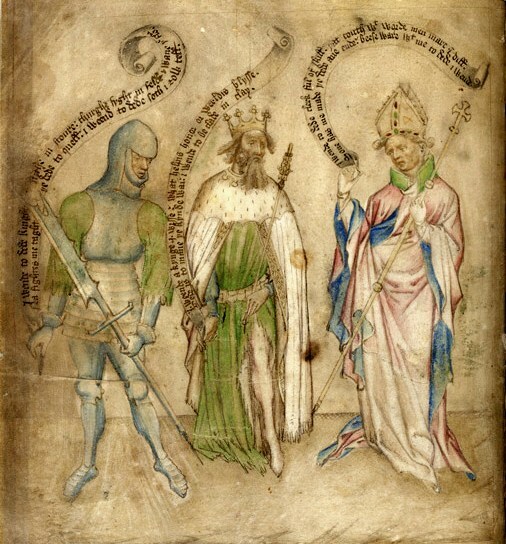 From the Navarre Picture Bible, 1197. One can almost imagine this as a holy weapon in some sort of video game. 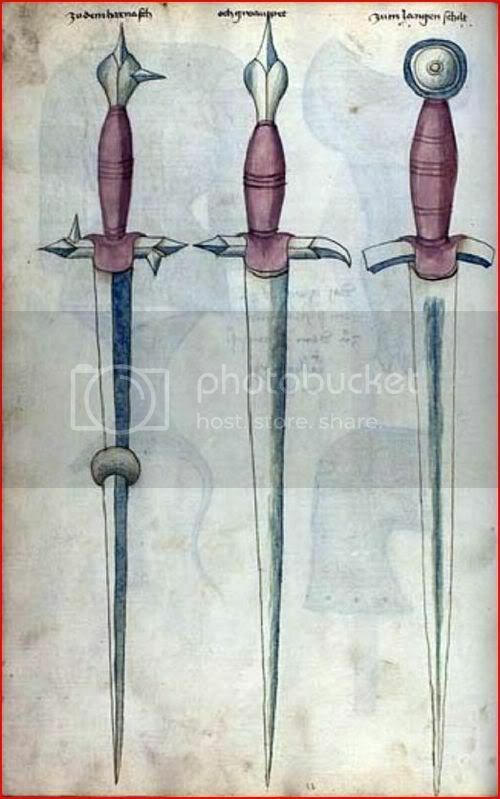 Fiore's Sword/Spear, from the Pisani-Dossi Ms.
A very strange messer from Talhoffer's 1459 manuscript. From Coutumes de Tolouse, 1300-1325. I'm not sure if this is a weapon, or a farming implement, but I've included it just the same. Isn't that just a boar sword? It looks like some sort of Papal ferula turned into a spear. A fitting weapon for an angel, I suppose. I keep seeing this motif, does anyone know the story?